Just the Business is a joint project between CAIS Employment Services and Conwy Communities First. We offer one to one business advice, a weekly drop in clinic, regular workshops and networking events as well as test trade retail opportunities. In partnership with Colwyn Bay Town Heritage Initiative we are able to offer free 12 week test trade retail opportunities in Colwyn Bay for individuals living in Conwy. Number 24 Station Road in Colwyn Bay was the original pop up shop which opened in July 2014. Due to the success and demand for additional test trading spaces, Number 22 was launched to provide a second retail opportunity. Number 22 will offer individuals living in Conwy with the opportunity to test trade their product within a bright, contemporary shop FREE of charge for 12 weeks. After the end of the 12 weeks individuals will be given the opportunity to move into Number 24 where they can stay for up to 6 months for a small nominal monthly charge. Following on from the success of the Number 24, Communities First’s new building and Number 22 officially opened its doors on the 7th July 2015. The store’s first trader is Carol Downes of Downsiedoup. Carol specialised in upcycled furniture and also makes beautiful handmade soft furnishings and jewellery. She also takes commissions, so if you have a dowdy piece of furniture in need of a new lease of life call into the shop for a quote! Carol is a Welsh artist, designer, illustrator and art teacher based in Old Colwyn. She began upcycling furniture 30 years ago to create unique children’s furniture. 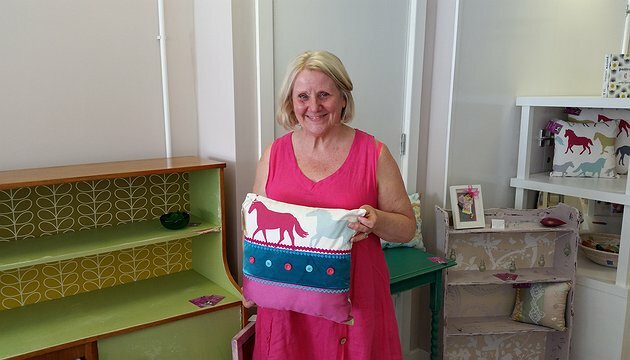 Over the last 12 months Carol has been selling some of her handmade items in Pentre Pethau in Llanwrst after the owner saw Carol’s work at a craft exhibition. Through word of mouth Carol became aware of the Just the Business project and discovered that there were test trading retail opportunities available in the heart of Colwyn Bay. Katie Sanders (CAIS), Jennifer Dutton (Communities First) and Judi Greenwood (Town Heritage Initiative) worked together to ensure that Number 22 was kitted out for commercial use. After accessing support from the Just the Business project over the last few months Carol felt confident enough to take up the opportunity to test trade. Jennifer and Katie were delighted to accept Carol as the first trader in Number 22 and the team helped her to prepare for opening day. If you have recently gone self-employed or are thinking of doing so or are interested in accessing the free retail opportunities in Colwyn Bay contact Katie on 01492 523 825 or Jennifer on 07717 543 257.